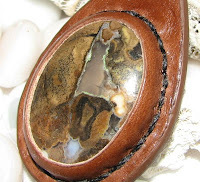 This is Eagle Eye Agate. Every piece has its own personality and characteristics, some quite dramatic, others more elegant or soothing. 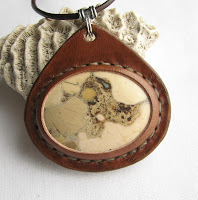 Agates, in general, have always fascinated me. 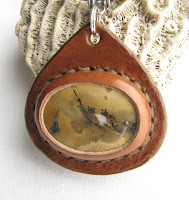 The colors and textures present in these bits of chalcedony are varied and often surprising. The Eagle Eye is a perfect example of this! In many samples you can see the record of millions of years of the Earth's percolation and formation. Some, like this first sample, have markings that truly look like eyes. Others have little dendritic fern patterns or swirls like cream in coffee. Some have pictures -- do you see the cat in this stone? My personal favorites are the mellow ones -- here's one that is evocative of fine Italian marble. 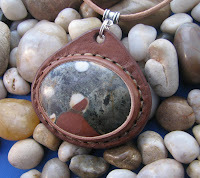 This is a popular stone -- most that I make are sold before I have the chance to list them to my online venues. No fears -- like I said, I love this stone! I will be making more! I'm tired of whining about this year's brutal winter... I'm pretty sure people are tired of hearing me whine about it, lol. 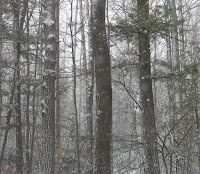 For a few days now it has been very spring-like, with temperatures well above freezing. Our snow pack, which was four feet deep just a couple of weeks ago, has diminished significantly. 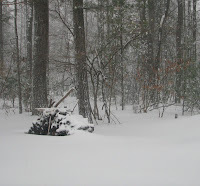 So I will not begrudge Mother Nature her little parting-shot today. 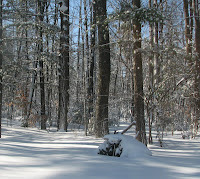 Little spit of snow, little bit colder -- but then the sun came out. Tomorrow is the Vernal Equinox, the first day of Spring! It's supposed to be warmer, back in the 40's or 50's. I have been having entirely too much fun making wristbands lately. Really! 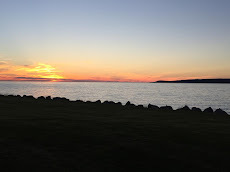 There's so much more that needs to be done (like more frequent blogging! ), and here I am, tooling and dying and painting to my heart's content! Ah well, lol. Here are two of my latest listings, just to share the joy. 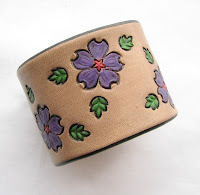 The big bright flower cuffs have been popular for me, but I dislike making too many of the same thing, so I did one in purple to compliment the reds & blues I've already listed. 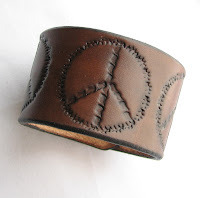 I have a special fondness for this peace-sign wristband in brown -- such a throwback to my early days of leathercraft! Yep, the hippie in me is still alive and well. There will be new projects on my table over the next few days; I have no choice in the matter! Summer will be here before I know it, and that's the busy season where I live. There is much getting-ready to tend to. Still, more of this kind of fun won't be too far off... I'm afraid I simply cannot help myself!